Pac-Man has only one goal: to get high...er. Sometimes, blatantly copying another game is OK, so long as you build a better mousetrap. Case in point, PAC'N-JUMP. It's essentially Doodle Jump mixed with Pac-Man. At first, this seemed like an odd combination until we lost an hour (then two) hopping to different platforms gobbling power pellets. At its most basic, PAC'N-JUMP plays like numerous other titles on the App Store. Your only goal is to keep Pac-Man alive by guiding him to higher platforms, making sure he doesn't plummet to his death, which forces you to restart from the beginning. That said, Namco Bandai expertly weaved traditional elements from its classic series to make the game unique. Consuming power pellets makes Pac-Man temporarily invincible, allowing you to briefly munch on those bothersome ghosts. In addition, munching on smaller power pellets and fruit propels Pac-Man upwards at high speeds. In fact, platforms eventually disappear, forcing you to skillfully ride a wave of pellets/fruit to safety. It's quite intense. On that note, the game has three control schemes, and we strongly suggest using the tilt option. Both the virtual analog stick (it's more of a slider, really) and d-pad don't offer the same level of precision or fun, for that matter. Meanwhile, PAC'N-JUMP has a wonderful presentation that'll appeal to longtime fans of the series. 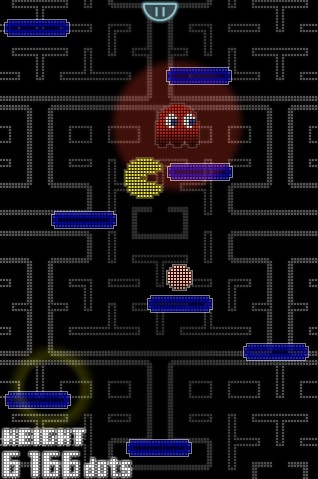 The first stage is classic Pac-Man, complete with mazes in the background and retro style graphics. Reach a certain height, and you'll unlock a Dig Dug stage, as well as boards inspired by Galaga and Rally-X, complete with signature music and enemies. Factor in achievements and leaderboard support (as well as the game's $0.99 price tag), and there's no reason to avoid PAC'N-JUMP. Namco Bandai took everything we love about Doodle Jump and improved the experience with some old school flavor. The result is an App that represents the best thing to happen to Pac-Man since Championship Edition on Xbox 360. What's Hot: Doodle Jump mixed with elements from Pac-Man, levels inspired by other Namco Bandai games, solid tilt controls, retro music, Game Center support. What's Not: No Ms. Pac-Man.